These days, more and more people are looking to have a wood router in their workshop. 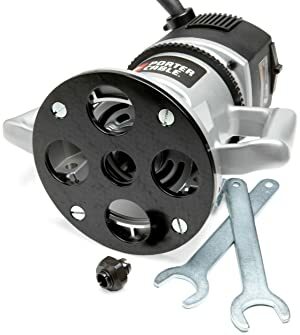 The ease of use and versatility of this power tool makes it handy to have when cutting, boring holes or trimming edges in material. If you are on the market for a wood router and not sure which model to get, the Porter Cable 7518 is a popular contender with a rich set of features. In this exclusive Porter Cable 7518 review, we’ll cover some of the actual benefits this router brings to the table and try to find if it is a good fit for your needs. If you want to buy a wood router, here are some reviews that I recommend to read such as Bosch 1617EVS, Bosch 1617EVSPK, Bosch PR20EVSK, Makita RT0701C, DeWalt DW618PK, DeWalt DWP611PK. The motor in this wood router is one of the best features of this device. At 15 Amps and 3.25 HP, it is a heavy-duty monster that will eat through material with great ease. It has a coil spring relief system around the motor that protects it from wear and tear, as well as external damage. The internal thermal circuitry automatically shuts the unit down when overheating. Technically, there is no way for you to burn this router - even under the most intense routing. It will simply not allow it. Having a router this powerful means that you can work with the toughest material and perform routing much more effectively - in less time than it would with a lower rated router. As your productivity increases, you can do more in less time. If you work with tougher materials than wood, then armed with a solid carbide bit this router can trim and bore sheets of metal with exceptional ease. If power is very important for the task you have at hand, this model should fit right at the top of your list. Moreover, other than being the strongest kid in town, the motor has a soft-start technology that guarantees ease of use and material preservation. You do not want the motor to start spinning at 21,000 RPM on first contact, especially on tough materials. It can be a health hazard where the router kicks back and you lose control - causing a health hazard to you and potentially destroying your material. That’s a well-thought feature. A variable speed control in a router is not something to write home about these days. After all, this functionality is pretty standard in most good quality routers. However, the range of speed that it offers is still a crucial factor to consider. The Porter Cable 7518 has a variable speed control of 10,000 RPM to 21,000 RPM. Those are decent settings (although, not the best), and allows you to work with a wide range of materials. This model performs speeds of 10,000, 13,000, 16,000, 19,000, and 21,000 RPM. It is definitely a feature that makes this router (and all routers in general) a versatile power tool. Porter Cable employs a proprietary technology called “Constant Response Circuitry”. What this does is that it prevents the router from under-powering when routing very tough material. The speed is always a constant, to the speed setting you choose. Bottom line, you get a standard and professional trim that looks as if it was machined cut by a much more expensive and professional power tool. Think industrial-grade. The Porter Cable 7518 comes exclusively as a fixed base router. There is no plunge base for this unit. With a fixed base, you get extreme precision of up to 1/64” - which is way more than what most people in the workshop need in terms of accuracy. The 7” base-plate of this fixed router is large enough to keep the unit stable during operation. It has a mounted miter gauge that makes it easy to adjust the bit adjustment setting and it firmly stays locked in position once set. The fixed base is very straightforward to use, and best suited for edge trimmings rather than to bore holes. If you are looking for a plunge base, this model is not for you since Porter Cable does not currently offer a plunger for this specific model. On the bright side, it sports wide and large 11” handles that make it an exceptionally easy and comfortable fixed base router to operate. If you do not want portability, you can easily mount it to a plate or table lift for even more heavy-duty action. The router bit is the actual part that makes contact with material and determines the finished result. The collet in this model has an auto-release mechanism, which means that it is easy to remove and add new bit sizes. Out of the box, it comes with a 1/2” collet but it can accommodate 1/4” collet size as well. A 1/4" collet might seem too small for such a powerful device but there may be certain uses for it. It does not constrain you in any way and allows you to use a router bit size adapted to the material you are trimming and work you are doing. Adjustments are one of this unit’s strongest trait. You can adjust almost anything with it, from the collet size to the bit accuracy of up to 1/64”. All those adjustments use a “twist-and-lock” principle which is very user-friendly. Even the speed control is memory controlled, which means that it will remember your last speed setting when the unit is powered-off. Porter Cable employs a sealed ball bearing design that helps keep dust away from the innards of this unit. This helps prolong the longevity as a whole. Sawdust is one of the prime reasons power tools end up dying on you, and it is good to know Porter Cable made provisions for this. The accessories delivered is pretty basic and you do not get a rich set. The only accessory you can expect is a pair of metal wrenches for the collet change. That’s about it! This is a recurring observation we see in routers, but one that is easily explained. Router accessories are not the most expensive and due to their huge popularity most hardware store will have them for dirt cheap. It seems Porter Cable went under the assumption that the ultra-powerful motor in this model should come at a premium price. Indeed, this model is much more expensive than venerated models like the Bosch 1617EVSPK, which has a much lower power but more versatility. Offered in one of the highest price of wood router (check current price here), it is outside the budget of many. However, the performance this model delivers on the job is second to none and should easily pay for itself in the long run if you need a very powerful router. Popular woodworking hub NewWoodworker.com talks about the features and benefits of this performing wood router. They bill it as a general purpose router that has a wide range of applications. As expected, this unit comes highly recommended from them but mostly because of its power. They like how it performs under heavy-duty load and how efficiently the speed controller in this unit works and deliver results. The depth adjustment also gets a big thumbs up, as it is extremely accurate and allows for very precise adjustments. Similar to their verdict, we too have difficulty finding a more powerful router than the Porter Cable 7518. Ultra-Powerful: The very powerful 15 Amps 3.25 HP motor is not something you see everyday in a router. This is a beast of a machine. Speed Control: It offers decent adjustment of the speed which allows you great versatility and efficiency when working with different materials. Collet-Change: The collet is easily changed with the include wrench-pair and you can easily retrofit smaller or larger router collets in this model. Ease of Use: The large and comfortable 11” handles of this unit allows you to rest both hands and work for long hours with no fatigue. Low Vibration: Despite its power, there is no vibration when operating even at the highest 21,000 RPM. This is most likely because of the motor coil string strain relief mechanism. Lacks a plunge base. This model will not fit the plunge base of other models and Porter Cable does not seem to offer one at this time. The Porter Cable 7518 is one of the most powerful routers we have ever reviewed. It can easily be fitted to a router table lift, or be used as a handheld device. Regardless of how you use this power tool, it will deliver a great overall routing experience. If you need a very powerful and versatile router for your work, look no other way and seriously consider getting this model. It does not matter whether you are a newbie or a professional. This model will quickly become your go-to router in the workshop. Plunge Router vs. Fixed Router: Which is Better for You?